Every year in May or June, students across the country reach a culminating point in their lives. This point arrives after years of reading, writing, thinking, and other projects. Of course I'm talking about the apex of an educational journey known as graduation day. 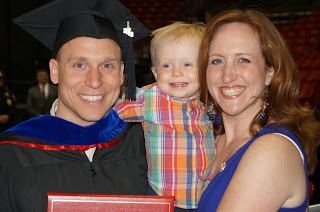 As someone who values education and learning, I'm proud to have achieved a significant milestone in my life by obtaining my Masters in Business Administration (MBA) degree from the University of Wisconsin. This has been a life goal of mine for quite some time. I began the MBA program for a variety of reasons. Mostly, I feel that I wanted to go down this path because of the skills I could learn, friendships that I could make, and confidence that it would give me in my career. My quest was always to become the very best kind of person that I could possibly be and reach my greatest potential. Inevitably, upon a momentous day such as graduation, one might ask, "what's next"? That's a great question that I continue to ask almost daily. I began my real estate sales business in 2005 and feel blessed to have achieved the level I'm at today. I recall some words from Dean Francois Ortalo-Magne on our graduation day. He suggested that we look at, "what makes you angry?" Huh? Angry? Really? How does being angry help anything? Okay, I'm listening. The things that make you angry and cause you to get passionate about making changes will be the things that really make a difference. A school teacher might get angry that there are not enough resources in their district and then is motivated to raise more funds. A researcher might be angry that there's no cure for a disease and then they are motivated to put in extra hours. In the real estate business, I am angry when Realtors don't put forth the effort to really help their clients and this motivates me to work harder to help my clients. I believe that what people get angry about, they are passionate about, and passionate people can change the world. For the past three years I have been focused on progressing my own career path forward. This inward journey has been a challenge with constant juggling of client meetings, family dinners, late night study sessions, and of course hours in the classroom. I have lofty goals for my business, my family, and my life. I look forward to using my new skills to help others reach their fullest potential as well. Congratulations to all the other graduates in 2013! Thank you friends and family for all your support over the years!